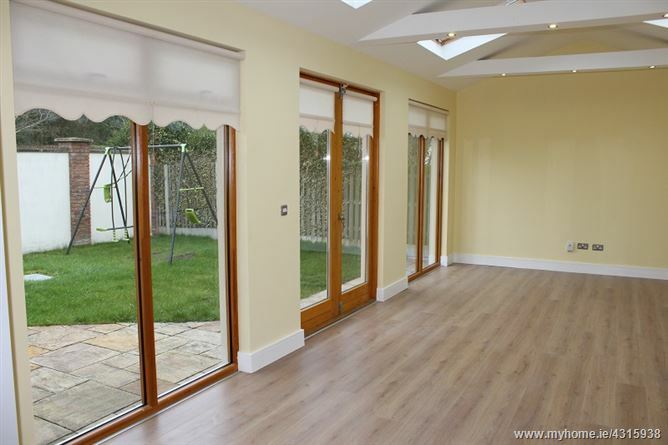 An extra-large four bed detached house with large extension to the rear. No. 8 Chapelwood Park offers a new way of living for those wishing to be close to the city centre. The area has seen considerable development over the past number of years, making it one of the most desirable locations in west Dublin. The location is ideal being within 30 minutes of Dublin City Centre and a short commute to Dublin Airport. The amenities at Tyrrelstown cater for shopping and leisure needs comprising restaurants, two supermarkets, medical centre, dentist, crèche, hair and beauty, pharmacy and many more. The M50 and N3 are within easy commuting distance giving access to all major routes. 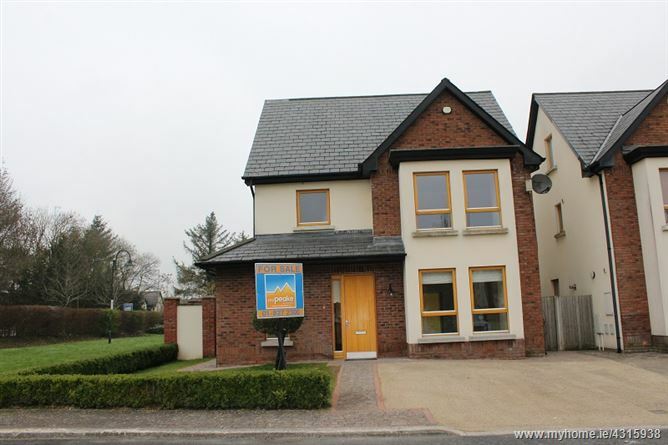 Situated on a good sized corner site this substantial four bedroom detached house extends to 210 sq.m. (2, sq.ft.) of luxurious, well designed and bright interiors. Internally the house comprises of Hallway, guest WC and study, large living room, exceptionally spacious kitchen/dining room leading to a fabulous family room with sliding doors leading to rear garden. 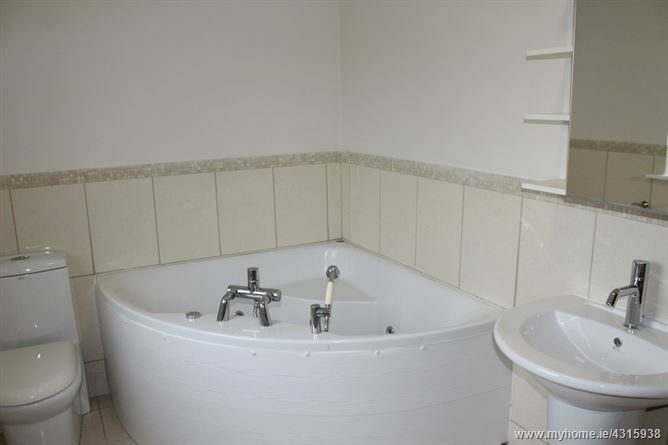 At first floor level there are three double bedrooms, 1 en-suite shower room and family bathroom. 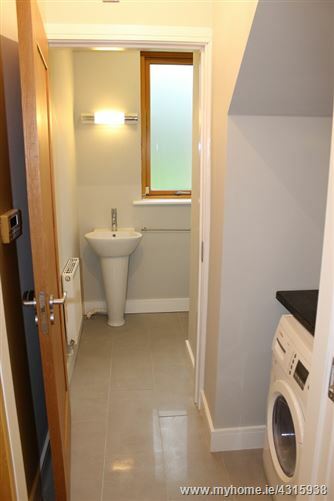 The entire second floor accommodates an exceptionally large master suite incorporating en-suite shower-room. Entrance Hallway: (c. 6.06m x 1.28) mtrs, Laminate wood flooring. Guest w.c.: c. 1.82m x 1.45mtrs. 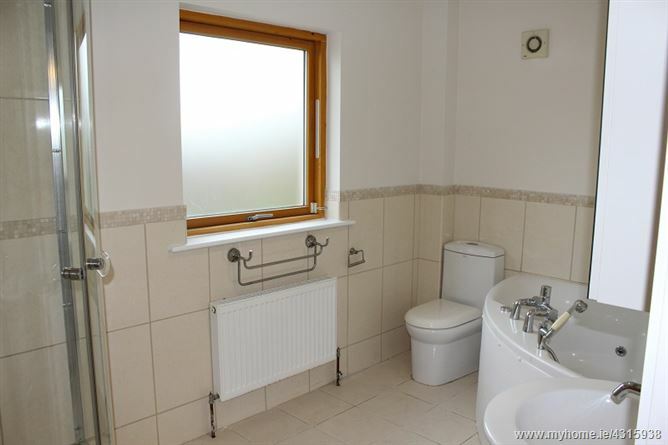 whb & wc, tiled floor & splashback. Kitchen/Dining Room: (c. 7.50m x 3.68 mtrs). 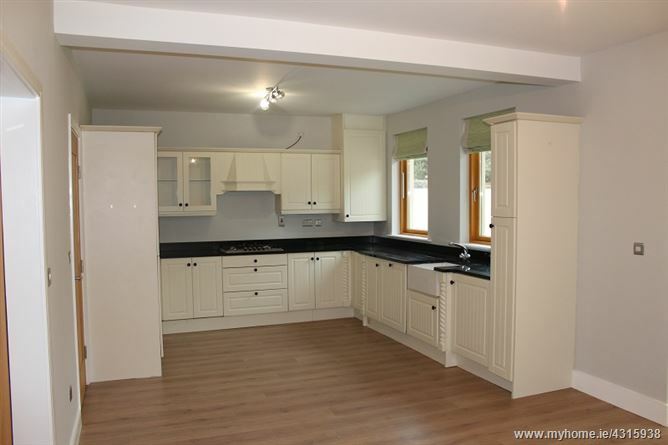 High quality fitted kitchen with granite work top and Belfast sink, Bosch appliances; integrated eye level oven (Bosch), micro-wave(Bosch) , five ring gas hob (Bosch), extractor fan, newly fitted integrated fridge/freezer/ integrated dish washer (Bosch). 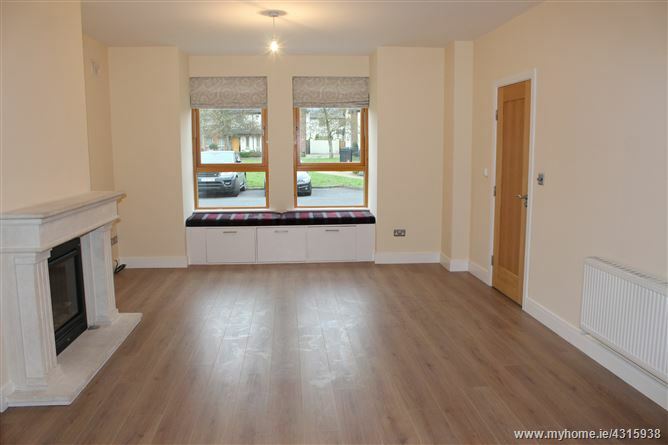 Family room: (c.7.15m x 4.46m) Laminate flooring, French doors, two full length windows. Living room: (c. 6.66m x 4.18mtrs). Double oak and frosted sliding glass doors from kitchen, Laminate wood flooring, feature fireplace with gas fire with glass insert. Master bedroom: (c. 4.00m x 2.77 mtrs). 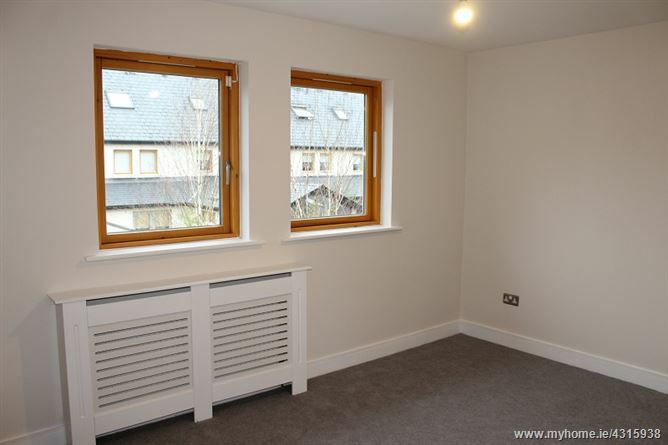 Newly Carpeted, Fully fitted Wardrobes, TV point. Bedroom 2: (c. 4.00m x 2.78mtrs). 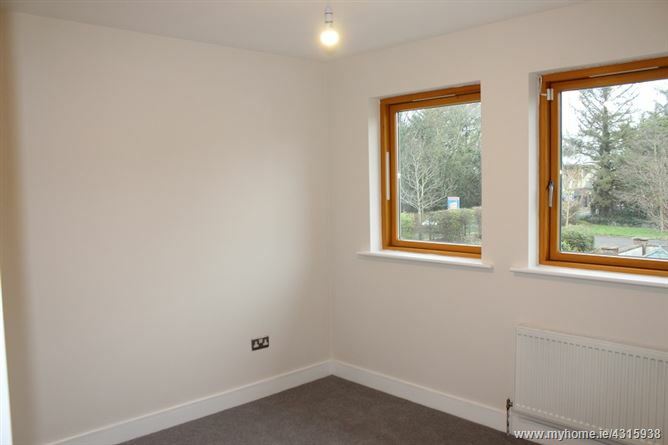 Double bedroom, newly carpeted, fitted wardrobes. Bedroom 3: (c. 3.37m x 2.76mtrs). 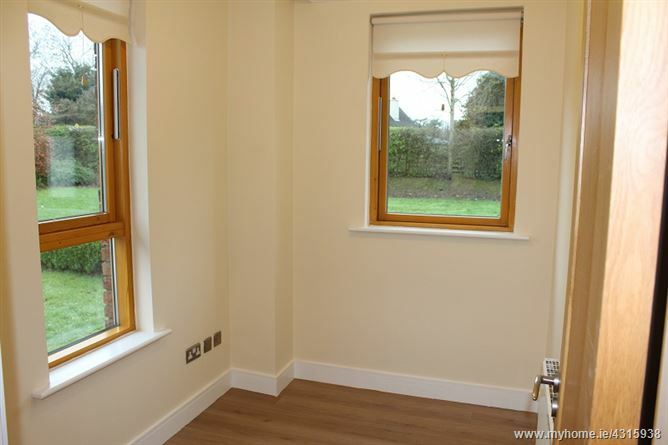 Double bedroom, newly carpeted, fitted wardrobe. Second Floor: Newly carpeted stairs. 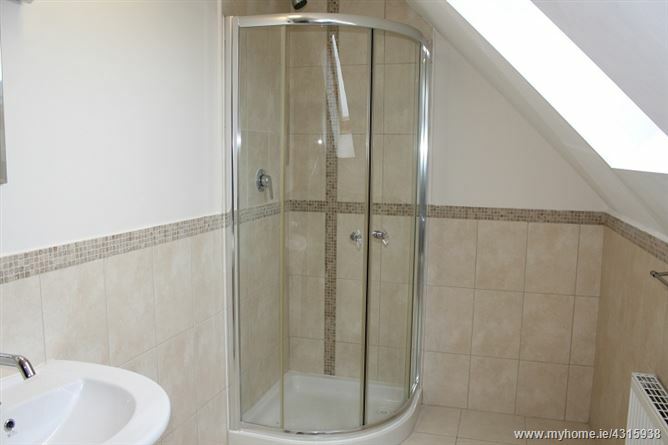 En-suite shower-room: c. (3.59m x 1.69mtrs). Tiled flooring and wall tile to dado level, shower cubicle, wc, w.h.b. and shaver light.